City of Puyallup Parks and Recreation offering family fun and fitness for all ages through Sports, Recreation classes, Camps, Fitness Center, Senior programming, Special Events and so much more. 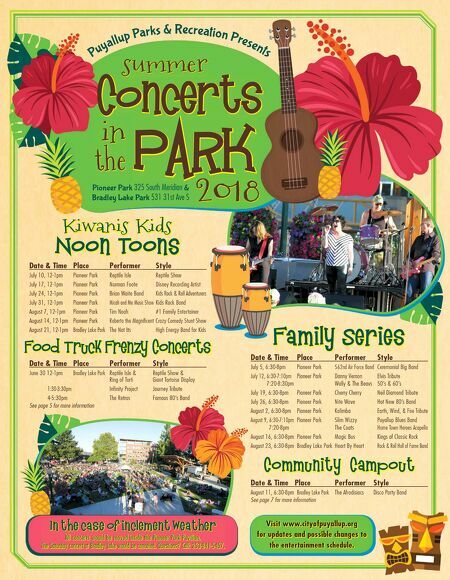 PARK in the Concerts summer Puya ll up P a r ks & R e c r ea ti o n Pr es en ts Family Series Kiwanis Kids Noon Toons Date & Time Place Performer Style July 10, 12-1pm Pioneer Park Reptile Isle Reptile Show July 17, 12-1pm Pioneer Park Norman Foote Disney Recording Artist July 24, 12-1pm Pioneer Park Brian Waite Band Kids Rock & Roll Adventurers July 31, 12-1pm Pioneer Park Micah and Me Music Show Kids Rock Band August 7, 12-1pm Pioneer Park Tim Noah #1 Family Entertainer August 14, 12-1pm Pioneer Park Roberto the Magnificent Crazy Comedy Stunt Show August 21, 12-1pm Bradley Lake Park The Not Its High Energy Band for Kids Date & Time Place Performer Style July 5, 6:30-8pm Pioneer Park 562nd Air Force Band Ceremonial Big Band July 12, 6:30-7:10pm Pioneer Park Danny Vernon Elvis Tribute 7:20-8:30pm Wally & The Beavs 50's & 60's July 19, 6:30-8pm Pioneer Park Cherry Cherry Neil Diamond Tribute July 26, 6:30-8pm Pioneer Park Nite Wave Hot New 80's Band August 2, 6:30-8pm Pioneer Park Kalimba Earth, Wind, & Fire Tribute August 9, 6:30-7:10pm Pioneer Park Slim Wizzy Puyallup Blues Band 7:20-8pm The Coats Home Town Heroes Acapella August 16, 6:30-8pm Pioneer Park Magic Bus Kings of Classic Rock August 23, 6:30-8pm Bradley Lake Park Heart By Heart Rock & Roll Hall of Fame Band Community Campout Date & Time Place Performer Style August 11, 6:30-8pm Bradley Lake Park The Afrodisiacs Disco Party Band See page 7 for more information Pioneer Park 325 South Meridian & Bradley Lake Park 531 31st Ave S 2 0 18 Food Truck Frenzy Concerts Date & Time Place Performer Style June 30 12-1pm Bradley Lake Park Reptile Isle & Reptile Show & Ring of Torti Giant Tortoise Display 1:30-3:30pm Infinity Project Journey Tribute 4-5:30pm The Retros Famous 80's Band See page 5 for more information Visit www.cityofpuyallup.org for updates and possible changes to the entertainment schedule. In the case of inclement weather All concerts would be moved inside the Pioneer Park Pavilion. 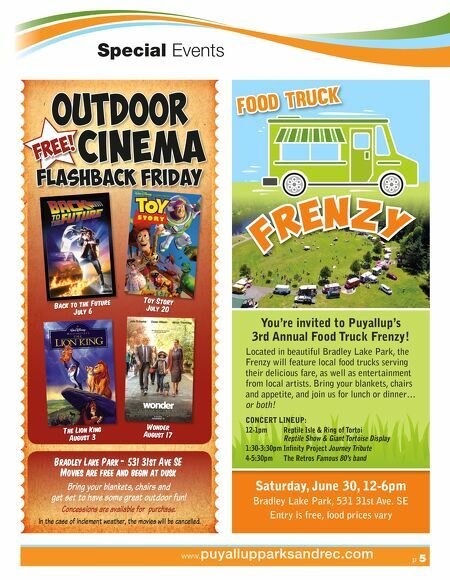 The Saturday concert at Bradley Lake would be canceled. Questions? Call: 253-841-5457.